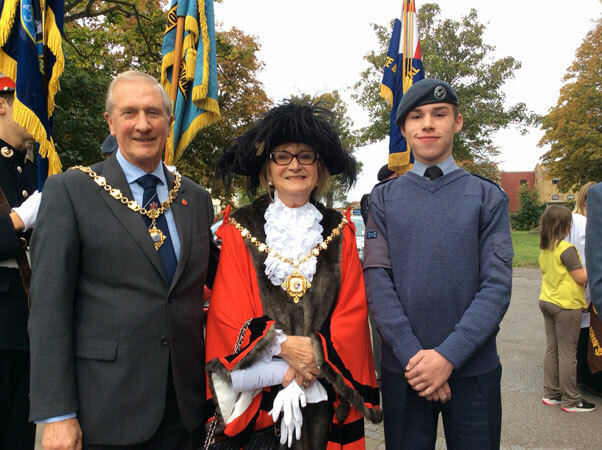 The Mayor of Margate, Cllr Rosamund Dixon, with her Consort Mr Geoffrey Dixon and the Mayor's Cadet, Corporal David Chapman of the Air Cadets, at the annual Civic Service which was held at St John the Baptist Church, Sunday 8th October. The Service was conducted by the Right Reverend Trevor Willmott, Bishop of Dover. Readings were given by Francesca May and Myles Harrison of Hartsdown Academy. The Service was attended by Mr Clive Stevens, DL of Kent, and Chairmen and Mayors from across Kent and as far afield as Brightlingsea in Essex. The Standards of the RNA, the Air Cadets and the Margate Sea and Marine Cadets were presented, along with those of the Beavers, Brownies and Guides. Representatives of many local organisations were present, as well as members of the public. The Mayor would like to thank all guests and especially the young people of Margate who made it such a memorable day.